The artists are part a 40-strong group made up of mostly fellow-artists going by the name of the Nope to Arms Collective. Some have artwork on display at the current exhibition, Hope to Nope: Graphic and Politics 2008-2018 and others in the permanent collection and museum shop. 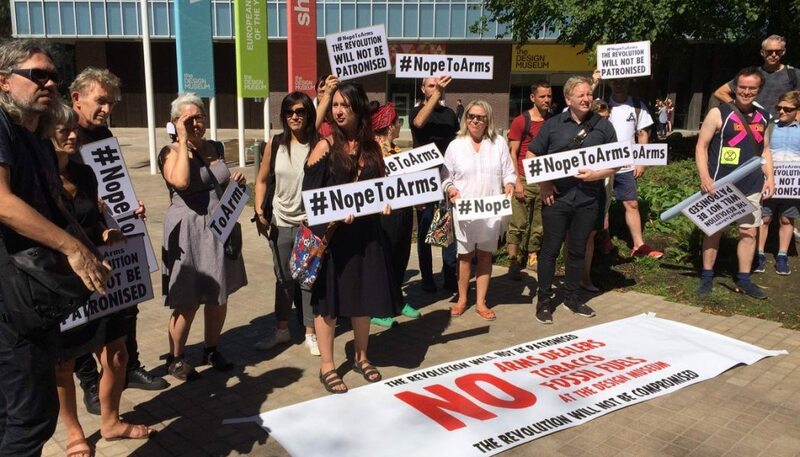 On Tuesday 17 July the Design Museum said its ‘atrium was hired by a company in the aerospace and defence industry for a private event’, which the group took exception to. This morning The Space Hijackers came to remove their Official Olympics Protestor t-shirt, which had been on display at Hope to Nope and Peter Kennard removed his Union Mask in the permanent collection display Designer User Maker, which had been donated to Design Museum. The museum had corresponded with the group to say that it would be reviewing its policies and to ask them to reconsider removing artwork. Design Museum directors Deyan Sudjic and Alice Black said in a letter published on the museum’s website today that the exhibition had been a popular and critical success, with more than 30,000 visitors since opening on 28 March, and the long term impact of the protests would be to reduce the work that the museum does, which is designed to benefit the sector and the wider public. The Design Museum, which was named European Museum of the Year in May, has committed to not having such private hires (linked to arms, tobacco and oil companies) while it takes time to ‘discuss the issues with our peers in the sector and review if any of our policies need to be updated’. As of 1 August, some artwork has been removed from the exhibition, before the exhibition closing date of 12 August, at the request of the lenders. As a result, and until the end of the run, the exhibition will now be free to visit. If you have already purchased a ticket, please call the bookings office on: 020 3862 5937 or email [email protected] Please note that the bookings office is open from 10am to 5pm, Monday to Friday. ‘We are sorry for any disappointment caused for visitors. We believe that it is important to give political graphics a platform at the museum and it is a shame that the exhibition could not continue as it was curated until its original closing date’.